Do you remember those episodes of Saved by the Bell where Zach and the gang would sit in a circle and reminisce about the past school year? I hated those episodes, as a kid I felt so cheated, like someone was taking the lazy route! As an adult, I suspect the writers were on vacation in Hawaii or something. 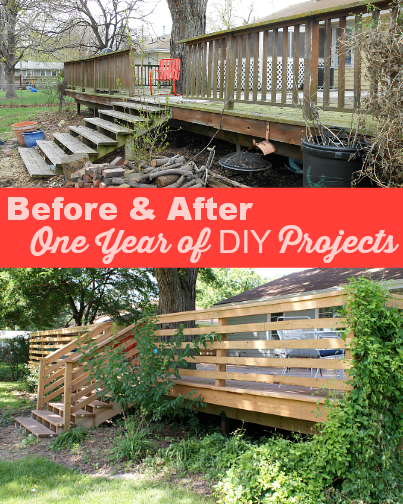 Anyways, since this week marks the one year anniversary of my blog, I thought it would be fun to take a look at some progress photos of our home renovation. Hopefully you won't feel disappointed like I did with those Saved By the Bell episodes! Most of the areas aren't quite finished, but it's so satisfying to look back on these photos and appreciate the work we've done and how far our little house has come! Let's start with the exterior of the house. Ahhh. So much better! The house painting is this close to being finished and I can't wait to share the transformation, this is a 'lil sneak peek. 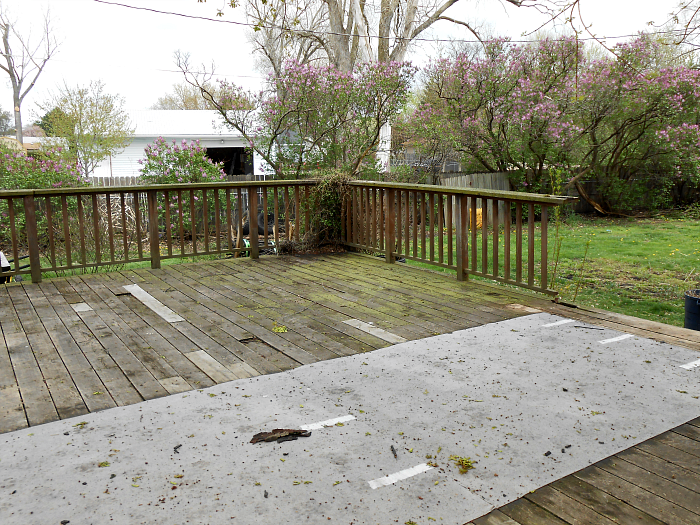 Here's another before and after of the deck. 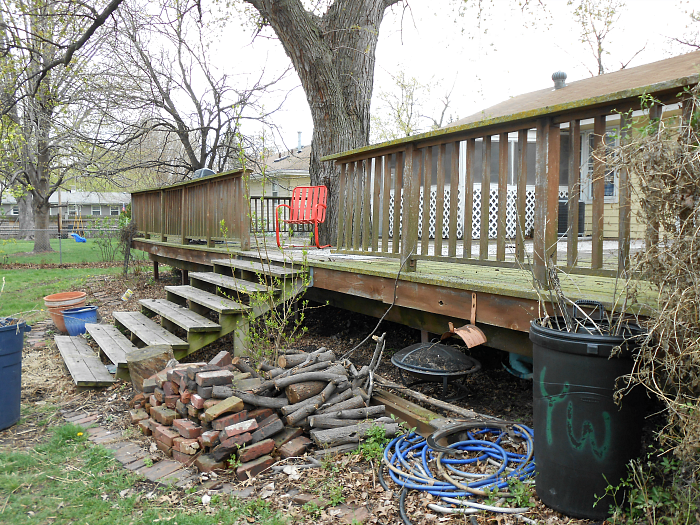 Jesse also removed a falling-down-rusty-tetanus-hazard of an old shed and built a new shed in the back corner of the yard. I'm not thrilled about the red stain, but the shed has nice lines and keeps our lawn equipment safe and dry. I'd like to paint it gray with white trim to match the house. Maybe this fall. We also did a LOT of work on the inside of our house. I'm not sure what to do about the coffee table situation, so if you have any ideas I'd really appreciate hearing them! I've been daydreaming about a brightly colored (teal velvet?) chesterfield sofa, but that would be a big splurge since the existing sofa really is okay. Maybe if I can sell it for a decent price on Craig's List Jesse will give in to the idea! We wrapped up the dining space last month and I LOVE it! Part of revamp included moving the light fixture so it was centered over the table, and I'm amazed by how a correctly positioned light makes the corner so inviting and finished looking. You can read more about the update in my reveal post. The kitchen update was fairly simple but tedious. Jesse removed the dated scalloping and I painted the cupboards and back splash and replaced some hardware. B's room was one of the first rooms I revamped and it was...trying too hard. I've been working on a make-under for for his room and the last element will be some wall decor and a big boy bed that Jesse is building. The office isn't quite finished, I have a few more things I want to do to this wall (I'm not sure if the lamp color is amazing or awful) and I'm cooking up a few DIY projects for the corner that isn't pictured. Wow - you did some great stuff! Especially love the dining room makeover. Keep it up! Thanks, Laura! I have lots of plans for the next twelve months - just need to figure out how to get more PTO so I can do them, LOL! Great transformations! I love seeing the before and after. 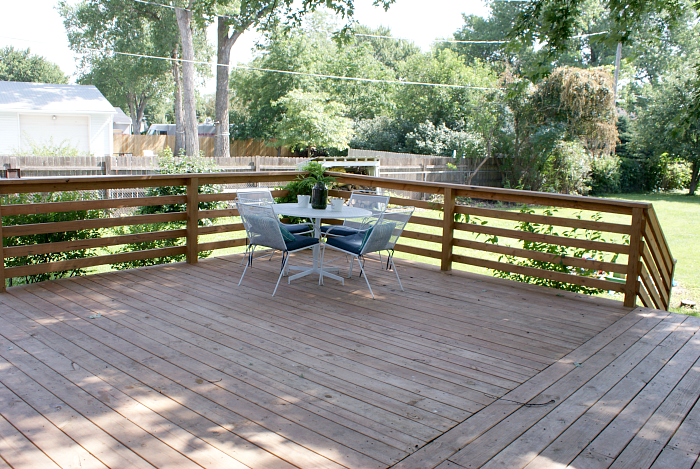 I'm in love with the horizontal boards on your porch! Did you guys build that yourselves? Where is that amazing blue chair from in your living room? Love it! Also, a tip for the kitchen: the hinges on the cupboard doors can be turned around so they are not visible. The kitchen lines will look a lot cleaner. You basically need to reverse the hinges. It is painstaking, but the payoff is worth it. We did this in my mother's kitchen. It made a world of difference. Hi Lindsey! My mom found the chair at an estate sale about a year ago - I love it too! Thanks for the tip on the cupboards. It's pretty likely that I'll be painting them again in a year or so since I didn't finish them off with a clear coat (total rookie move! ).